It seems that developers are going out of their way to market their apartments in landlocked Old Worthington, OH. They are not mundanely giving away ceiling fans or trying to make their neighborhood fancy by adding an "e" to old and calling it Olde Worthington. Instead, they've built a lighthouse and created a small ocean. At least that what it looks like in this scenic advertisement. Of course, I could be mistaken. Sorry Jen. Circleville has taken to turning a "Castle-e" into a B&B. it would be funny to go there for the tour and at the end ask "where's the lighthouse?" 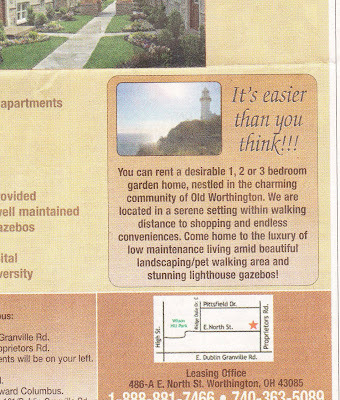 when they say "what lighthouse" you say "you know, the one by the small ocean shown in your advertisement." 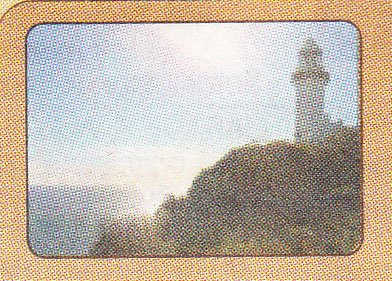 then of course you tell them you don't think you could live somewhere without a lighthouse. I believe that shot of ye olde lighthouse is along the Olentangy, just south of the Graceland Towne Center. See, this is why everybody gets all bent out of shape about the Morse-Bethel connector. Would you want to destroy this beautiful landscape?